I had the pleasure of meeting with Jim Langley, Psy. D., of St. Raphael Counseling/Catholic Charities this past week. I thought is was very important to establish a relationship with St. Raphael Counseling because, as you are probably very aware, oftentimes with cancer comes emotional/psychological distress. This can be with patients or with caregivers/spouses/siblings and anyone who is otherwise affected by the arise of cancer. Our ministry is directed towards the spiritual health of those affected by cancer but there is much crossover within the conversation. If you read my blog or had a chance to talk with me about my experiences since 2009 you would understand that I am a firm and ardent believer in the healing power of Christ and the love and grace He and our Blessed Mother, the angels and saints, and the Holy Spirit give us. You would also learn I am also an ardent supporter of psychological counseling, especially when it comes to cancer. Cancer is a family illness, for all of us, and my experience was and is no exception. Real problems can arise, not due to intentional ill will or lack of love, but because our new circumstance create an unavoidable need for some form of change. Change is difficult for everyone, and especially if the patient needs more help. Many times families, friends and patients are able to adjust to the “new normal” with minor bumps along the way. That is not the case for everyone, especially when someone is called home to our Heavenly Father. We as patients experience so many losses, financial, job, purpose, hobbies, etc. The manner in which we go through our daily lives, for no matter how long we are blessed with living in this beautiful world of God’s creation, needs adjustment. Having the opportunity to speak with a psychologist to address specific issues can be invaluable. I have had psychological counseling off and on, even prior to my cancer diagnosis, due to depression. I am an avid supporter of psychological services and would love it if the medical oncology community would include psychological screening and treatment as part of their standard treatment protocol. I know I am not alone in this view. Here is a link to St. Raphael Counseling https://www.straphaelcounseling.com/. I find this providential because my confirmation name is Raphael. Here is a link about St. Raphael, whose feast day is September 29th. 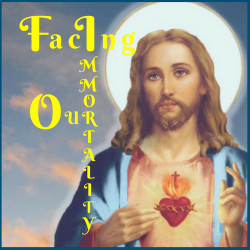 It is my hope, our hope, that with the ongoing monthly support group and intermittent specialty retreats offered by Facing Our Immortality, that we can be not only a means of connecting and renewing our spiritual connection with the Holy Trinity, but also be able to properly refer out into the community for your special needs. Please don’t forget about the upcoming Men’s Retreat at Mother Cabrini Shrine, we still have openings for patients and non-patients alike. Maybe there is someone in your like who is in need of this unique retreat. We will be having our monthly support group on October 8th at Our Lady of Lourdes, starting at 6:30 pm. Please contact me if you will want to participate, either in person or remotely.